Born a poor shepherd, Pedro devoted his time with the flocks to prayer. At age thirty-one, he journeyed to Guatemala City in hopes of a job away from the sheep. Befriended by the Jesuits and Franciscans of the area, he enrolled in the Jesuit College of San Borgia in hopes of becoming a priest. However, with little background education he was unable to master the material, and withdrew. He then took private vows, and became a Franciscan tertiary, taking the name Peter of Saint Joseph. Three years later he opened Our Lady of Bethlehem, a hospital for the convalescent poor. Soon after there was a shelter for the homeless, schools for the poor, and an oratory. Not to neglect the rich of Guatemala City, Pedro walked through their part of town, ringing a bell, begging support for the poor, and inviting the wealthy to repent. Other men were drawn to Pedro's work, and they formed the foundation of the Bethlehemite Congregation or Hospitalers Bethlehemite, which earned papal approval after Pedro's death. He is the first canonized Guatemalan native. Pedro built chapels and shrines in the poor sections of the city, and promoted the ministry of intercessory prayer among those who had nothing except their time. He is sometimes credited with originating the Christmas Eve posadas procession in which people representing Mary and Joseph seek a night's lodging from their neighbors. The custom soon spread to Mexico and other Central American countries. Legend says that petitioners need only tap gently on Peter's stone tomb in order to have their prayers fulfilled. Stone tablets scratched with thank-you notes are often left on the tomb afterwards. Believed to be the young man who ran away when Jesus was arrested (Mark 14:51-52), and the "John whose other name was Mark" (Acts 12:25). Disciple of Saint Peter the Apostle who travelled with him to Rome, and was referred to as "my son Mark" by the first Pope. Travelled with his cousin Saint Barnabas, and with Saint Paul through Cyprus. Evangelized in Alexandria, Egypt, established the Church there, served as its first bishop, and founded the first famous Christian school. Author of the earliest canonical Gospel. Born to a poor family, Giovanni's mother died when the boy was nine years old, and the boy grew up in the slums, indifferently educated, but mentored part of the time by his religious maternal grandfather. As a young man he discovered a call to the priesthood, and he was ordained on 24 December 1865; assigned to the parish of Saint Alexander, Carzago Riviera, Bedizzole, Italy. Worked with poor youth and young factory workers in the Brescia region. On 3 December 1866, he and Father Pietro Capretti founded the Workman's Institute to provide support and help keep Christianity in the lives of young people moving to the city for work. With Father Giovanni Bonsignori he founded Agricultural Colony of Remedello to provide similar services to farm workers. Religious brothers and sisters were drawn to the work Father Giovanni was doing, and in March 1900 he founded the Congregation of the Holy Family of Nazareth and the Congregation of the Sisters, Humble Servants of the Lord as formal religious congregations for them. His foundations and congregations continue today, furthering Father Giovanni's dedication to young people. Placed in the Benedictine convent of Saint Syrus at Piacenza, Italy in 1177 at age seven, she joined the Order at age 14. Abbess while still young, but removed from the office due to the severe austerities she imposed, and she became isolated from most of her sisters. However, one of the sisters, Carentia, agreed with her discipline. When Carentia entered the Cistercian noviate at Rapallo, Italy, Franca persuaded her parents to build a Cistercian house at Montelana, Italy which they both then entered. Franca became abbess of the community, which later moved to Pittoli, Italy. Franca always maintained the strict austerities she imposed on herself, even in the face of failing health, and spent most nights in chapel, praying for hours. Graduated from Brasenose College, Oxford in 1578, and continued his studies abroad. Converted to Catholicism, and entered the English College at Rheims, France in 1580. Ordained at Rheims with his friend and co-worker Blessed William Marsden. Sailed for England as a home missioner, but their ship was driven off course, and wrecked on the Isle of Wight. Arrested soon after, they were charged with being priests on English soil. They argued that they had been shipwrecked, and had no choice about being there; due to the appeal, they were sent to London for further interrogation. There they acknowledged Elizabeth as their lawful queen in temporal matters, but would not not in matters spiritual. Martyred. Parish priest in Silao, Mexico noted for his zeal as a pastor to his parishioners. During the Mexican Revolution, laws were enacted that required priests to register with the government; Jose did not register, and in 1927 went into hiding in León. In April 1927 Father Rangel went to secretly celebrate Holy Week with the Minims in San Francisco del Rincón where he administered the sacraments and visisted the sick in hospital. Discovered by authorities on 22 April 1927, Father Jose admitted to being a priest; he was arrested, interrogated, tortured, and shot. Martyr. Joined the Missionary Oblates of Mary Immaculate at age 20. Ordained at 25. Missionary to Laos in 1957, caring for the sick, ministering to people suffering from the persecutions of the communist guerilla group Pathet Lao; he wrote a diary of his experiences, later published as To Be a Happy Man. Martyr. Convert to Catholicism; entered the English College at Rheims, France in 1580. Ordained at Rheims with his friend and co-worker Blessed Robert Anderton. Sailed for England as a home missioner, but their ship was driven off course, and wrecked on the Isle of Wight. Arrested soon after, they were charged with being priests on English soil. They argued that they had been shipwrecked, and had no choice about being there; due to the appeal, they were sent to London for further interrogation. There they acknowledged Elizabeth as their lawful queen in temporal matters, but would not not in matters spiritual. Martyred. A devotion observed to appease God's wrath, ask protection, and invoke a blessing on the harvest. The Litany of the Saints is chanted in the procession, and the Rogation Mass follows. The older procession of 25 April, called therefore Major Litany, Christianized a pagan procession in honour of the god Robigus. 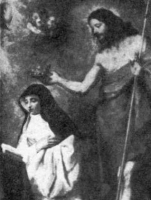 The institution of the others, adopted in Rome under Pope Leo III as Minor Litanies, is ascribed to Saint Mamertus of Vienne who, c.475, ordered processions with special prayers because of calamities which were afflicting the country. 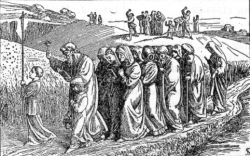 Rogation days were dropped from the Church's calendar in the reform of 1970, but since 1988 have been revived. Studied at the Cathedral School of Laon, France. Priest. Monk at the Benedictine abbey at Lobbes, Belgium. Spiritual student of Saint Ursmar. Bishop of Lobbes in 711. Second abbot of Lobbes in 718. Supported missionaries, known for wisdom and personal holiness, and the gift of prophecy. Born to a large and pious farm family. Entered the Claretians in 1914, making his perpetual vows in 1917. Ordained in 1922. Home missioner in Mexico. Martyred during the Mexican Revolution for being a priest who did not submit to government control. Layman. Martyred in the anti-Catholic persecutions of the Mexican Revolution. Young lay catechist in the apostolic vicariate of Luang Prabang, Laos. Martyr. Priest. Fourth-century bishop of Agen, France. Presided over several Councils including Rimini in 359, Valence in 374, and Zaragoza in 380. Friend of Saint Hilary of Poitiers with whom he waged a successful fight against Arianism in Gaul; his only surviving writing is Contra Arianos (Against Arianism). Shoemaker. Converted by Saint Mark the Evangelist, worked with him to evangelize Alexandria, Egypt, and succeeded him as bishop there. Deacon from Antioch, Syria. Travelled with Saint Ignatius to Rome, Italy, and after his martyrdom brought his relics back to Antioch and wrote about him. Bishop. Abused by heretic protesters at the Council of Chalcedon. Martyr. Benedictine monk. Abbot at Saint Germanus, Auxerre, France. Bishop of Auxerre. Spiritual student of Saint Mel of Ardagh. Bishop of Croghan, Offaly, Ireland. Helped preside at the ceremony where Saint Brigid of Ireland took her vows. Patriarch of Constantinople. 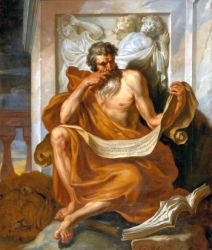 Exiled by Arians for defending the decisions of the Council of Chalcedon. Fourth century travelling bishop. Ordained by Saint Hilary of Poitiers. Evangelized Cornwall. Abbot of a monastery in Syracuse, Sicily. Three Christian laymen martyred together in the apostolic vicariate of Korea.